Last week, I was listening to BYU Radio in the car and heard a segment about how different cultures find meaning in their lives. The guest was Meg from Meg in Progress. I had heard of her but hadn't read her blog before. She said several things that really got me thinking. The host asked Meg how she felt about women in the workplace and if there's pressure for stay at home moms to do more than "just be a mom". 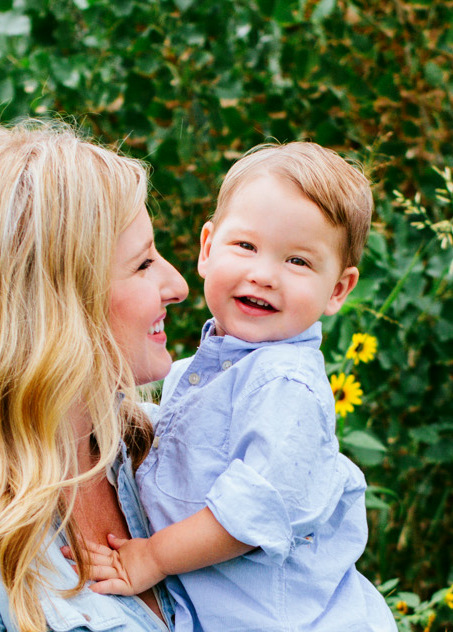 When he asked that, I knew the intent of his question, but I felt a little knife in my gut, just like I do when I hear or feel that judgement that I'm not smart enough or too lazy to do more with my life than just be a stay at home mom. I feel it often. Sometimes from other people and sometimes from myself. I always wanted to be a mother. My whole life I dreamed about my children and raising them. Sure, I had no inkling of how hard it would be, but like most life dreams, I was willing to work hard to get there. It still is my dream job and most of the time, I feel proud about that. Meg's response also got me in the gut, but in a good way. She explained that her husband (update: I misunderstood and it's actually her friend's husband) is an AP science teacher and he has some female students who really excel academically, but they decide "not to go to college or become hairdressers" because they want to be able to stay home with their kids. Her husband would sometimes feel like they were wasting their potential. Here's the thing. There's not a "one size fits all" choice. If an 18-year-old girl doesn't excel in the classroom, let's not assume that she should "just get married and have kids because that's all she can do." Talk about a self-fulfilling prophecy! Or if she has a certain GPA and is clever and strong, let's not call her "wasted potential" if her goal is to be a wife and mother. Heaven knows mothers need to be smart and determined! Instead, as a culture, let's support each woman and her choice to either stay home with her children or pursue her educational/career goals. Less judging, more supporting! That's the only way to create an environment for us to thrive and actually do some good. I'm tired of feeling like we have to prove our unique value when the thing is, we are equally valuable and amazing. For me, I knew that I wouldn't be truly happy if I didn't have children. I knew that my life's work and joy would be through raising a family. I also know that I have other talents and goals. This phase of my life where my kids need me home won't last forever and I plan to work towards those goals. My choices are the right ones for me. I felt this baby move a lot inside me today and it made me wonder what she is like. I want to teach her so much and I hope she finds my example a good teacher. I hope that I can teach my daughter to be smart and confident in the choices she makes. I hope she has challenging goals for herself and that she respects motherhood for its beauty and own unique set of challenges. I hope she will educate herself beyond the classroom and that she will feel sure that her value is worth so much to me. Even right now, in this moment, when I don't even know her yet. Anyway, that's just what I'm thinking about right now. Also, I am loving this blog post about 10 Post-Birth Surprises. I laughed out loud at this whole thing... cause it's true. P.S. there's some language - FYI. At first glance of the title, I thought maybe you were going to give us a tutorial on finding bras :-) You know I love this! I loved our conversation about this last week, and I know that even if the world doesn't see our value, God does. He also knows our potential to reach those other dreams! All in good time. Love your face! I totally know what you mean when you say "knife in the gut." I just finished reading Brene Brown's "I Thought It Was Just Me, But It Isn't: Making the journey from what will people think to I am enough." It was SO GOOD and she clarifies that those feelings often indicate shame triggers (motherhood is a HUGE shame trigger for the exact reasons you've said) and she discusses how to deal with shame. It's a fantastic read!!! Thanks for the recommendation Jane! I will check that book out. What an interesting concept of "shame triggers"... Sounds like a great read! Thank you for sharing this! I encountered that gut-wrenching attitude a few times in college when I spoke of my plans that didn't include using my degree. Just today, I was having a really hard time finding "joy in the journey" of motherhood, so this was divine timing. As a professional woman without children, I just don't "get" this. You choose to stay home with your kids. It's great. Some women don't, because they really like their work, or economic circumstances require them to work. Regardless, SOMEONE ends up taking care of the kids (don't get me started on low valuation and wages for childcare workers!) and it has to happen 24/7. No one's better or worse for making the choice that best fits their family. The world is rough enough on women, let's stop tearing each other down. I think you misunderstood my point, Pink Pirate, which is that no matter what we choose (to stay home or choose to work or not have children at all), we all need to "judge less, support more." It's a unique, personal decision and each choice has its own set of challenges. Hello! It's titled, "Support The Girls!" How could anyone not understand that is what you meant? Did she not read, "Instead, as a culture, let's support each woman and her choice to either stay home with her children or pursue her educational/career goals. Less judging, more supporting! That's the only way to create an environment for us to thrive and actually do some good. I'm tired of feeling like we have to prove our unique value when the thing is, we are equally valuable and amazing." Oi. I should probably walk away slowly. "Heaven knows mothers need to be smart and determined!" Absolutely. It's one the most demanding, challenging professions, & even more so (I think), because there is no paycheck & very little recognition for all the daily stuff we do. I've thought a lot about this lately. I've always brought in some sort of income since being married nearly 10 years ago. I love to support my family in this way. My husband has always supported my goals & dreams to develop & strengthen my talents. But underlying it all, is the understanding that one of us will be with the kids most, if not all of the time. For now, that's me, but in the future, who knows? We've always had a somewhat flexible approach towards raising our family. At times my husband was the stay-at-home parent, at times I've been the stay-at-home parent. I feel strongly in women gaining as much education as possible & contributing to home & family life, while, at the same time, as their time & energies permit, participating in the greater world outside home. It requires discernment, & a lot of communication with your spouse, but so many women have done it, are doing it (balancing home & career lives). Exactly, Janae! Yours and your husband's example is one that I find so inspiring. That was my whole point about how our roles as women are not a "one choice fits all" answer. I also feel strongly about getting an education and doing our part (whatever that may be) to contribute to family life. I am so glad that my parents encouraged me to get my degree. I'm not currently using it in the traditional sense, but I plan to some day and the lessons that I gained in doing so, have blessed my life immeasurably... but that was MY choice and it was the right one for ME. :) I wish society (especially Americans) would support stay-at-home moms, working moms, women who don't have children but want to and women who choose not to have children as each equally valuable. What a great post! One of my readers reads your blog and was like, Meg! A girl I love wrote about you! You know, though the AP teacher was the husband of one of my friends. Riley (my guy) is totally on board with my thoughts on women. Even pushes them himself. I wrote this piece about exactly the conversation you are having here: http://www.meginprogress.com/a-call-to-womanhood-intrinsic/. I am so glad lovely women like you are talking about this! An open dialogue on both sides can help so many people! Get it, girl! Hi Meg! I am so excited that you read this! Woo-ee! :) From reading your blog (which I am now a HUGE fan of) I can tell that your Riley is a stellar guy. It sounds like you two challenge and support each other, which is such a great example of a good marriage! I love what you said in your post, "What if we all took a breath and felt that our worth is intrinsic and not made more or less by our works? What if the value of a woman is determined simply by her being, by the act of her very creation? What if everything else is important, but not fundamental? What if we finally, eagerly, happily decided that we are essential? What if once we acknowledged this in ourselves, we acknowledged it in everyone else?" That's a great lesson to all women. Thanks for being awesome and inspiring! When I finished my graduate degree, I was totally planning to be a full-time stay-at-home mom. Fast forward a decade and I'm still teaching two classes a semester at the university where my husband is in his last year of doctoral studies...and we have five kids! My graduate degree is what has enabled us to have our family and zero student or car loans. It's not what I pictured when I started college or when I became a mom, but I am so glad that I can have the best of both worlds and mother all day even if I'm teaching at night. And I am super grateful for a husband who has supported me in not working full-time, even though we could be living very comfortably if I was, since my training is such that I would be making double what he will. That's great Rachael! I'm glad you found something that works well for your family! I really, really, really hate the Mommy Wars, and there totally needs to be more support and less judgement. I've never understood it; you staying home with your kids doesn't directly impact my life, so why be all rabid about it? I think so much of it stems from people not being confident in their decisions, whether that decision is to stay home or to work outside the home. I work because I choose to, because I love my job, and I feel I'm making a big impact in my field. I also have two children. I've had some "friends" take jabs at me with the "it's sooo great you work, but I couldn't imagine having someone else raise my children!". Some people just can't be happy unless they are breaking other people down and that is sad. Here's to happy moms and happy families, regardless of how they function! Even the term "mommy wars" makes my skin crawl! I hate them too. Isn't parenting hard enough than to have judgement from other parents to deal with too?! Sheesh. You're so right that lack of confidence is the biggest issue with feeling valued as a woman. I wish it wasn't true but I know that I feel guilty and almost a little embarrassed and I tell people I am a stay at home mom. It's the right choice for me and my family, and yet, I feel so unvalued most of the time. Your attitude is inspirational - do what's best for your family and be happy with that! I'm just trying to do my best to support the women that I know by supporting their decisions for their family. No more snarky comments about such a personal decision for someone else's family! Yikes! And please excuse that horrible grammar in that comment. Leaving comments on an iPhone is the worst! I really wish everyone had the ability to do both, because it would make a huge difference. I was home for six months with my first, and those were the hardest six months of my life! It's hard to work and balance a family too, and I don't think either group has it easier or better. I really liked your blog post. And the post pregnancy facts. It's a good thing babies are cute! Every time I start reading one of these "types" of posts (from my desk at work, none-the-less) I feel the incredible weight of guilt creeping in that I work when I'd rather be at home. Financially, it is necessary for us. I was SO relieved to keep reading and find a place of non-judgement and support. (Laughing that I, too, thought this might be about bras and I never call them "girls"). Thanks so much Elizabeth! You're a beautiful mother. Hey! That's my post! Thanks for the shout out. And I hate when people say, "just a mom," too, but I admit I've said it to describe myself from time to time. It's just so easy to talk yourself down, isn't it? And I loved this post -- "just a mom" has come out of my mouth before, and I always hate myself afterwards. Just getting back to this, sorry! I wasn't saying I didn't "get" your post, I was saying I didn't get why women & society do feel the need to be so judgemental of each other's choices. Re-reading what I wrote I realize it sounded harsh/critical and I so did not mean that! It was actually meant in agreement and empathy for your feelings. :) be well.